Saturday November 19th 1921 We had lunch early and was at Harrys office by one oclock. He took us in the car to see places of interest. Then a long ride through what was "The Centennial Grounds." If I could only have had Will with me or written him about it. After early supper all went to a picture show. 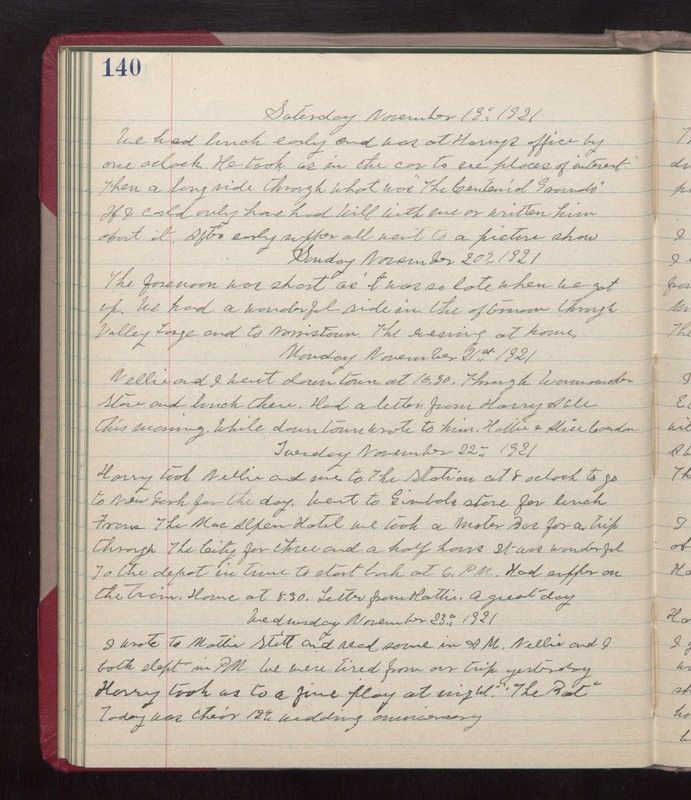 Sunday November 20th 1921 The forenoon was short as it was so late when we got up. We had a wonderful ride in the afternoon through Valley Forge and to Norristown. The evening at home. Monday November 21st 1921 Nellie and I went down town at 10.30. Through Wanamakers Store and lunch there. Had a letter from Harry Able this morning. While down town wrote to him, Hattie & Alice Condon. Tuesday November 22nd 1921 Harry took Nellie and me to The Station at 8 oclock to go to New York for the day. Went to Gimbals store for lunch From The MacAlpen Hotel we took a Motor Bus for a trip through The City for three and a half hours. It was wonderful. To the depot in time to start back at 6 PM. Had supper on the train. Home at 8.30. Letter from Hattie. A great day. Wednesday November 23rd 1921 I wrote to Mattie Stitt and read some in AM. Nellie and I both slept in PM. We were tired from our trip yesterday. Harry took us to a fine play at night "The Rat." Today was their 12th wedding anniversary.